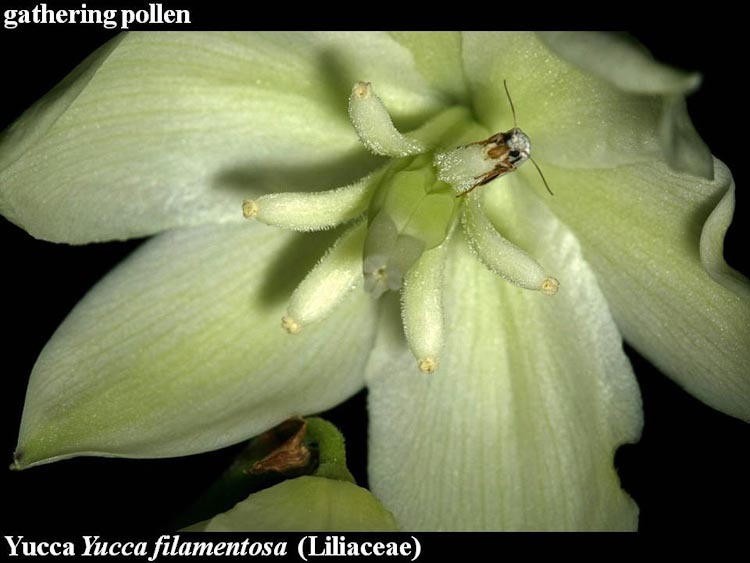 For a flowering plant to become a fruiting plant, pollen must be transfered from a stamen (preferably on another flower, on another plant), through a process called pollination. Next, a sperm cell from inside the lucky pollen grain must penetrate an egg cell deep within in the pistil, thereby performing fertilization of the egg. The resulting zygote (fertilzed egg) will develop into an embryo plant –a seed. Depending upon the plant species, facilitated by adaptive modifications to encourage a particular type of pollination vector, pollination is most often carried out by some type of animal, such as a bee, a bird, a bat or a butterfly. Or a moth. Of course, many plants are wind-pollinated (including grasses, sedges, rushes, and many trees) and a very few (eel-grass, for instance) are water-pollinated. Below, an elegant illustration of the process. The stigma is a very special environment for a pollen grain, having the proper nutrients and growth-stimulating chemicals to enable the grain to grow a long, hollow hair-like extenstion called a pollen tube down through the tissues of the style, eventually bursting into a egg-containing ovule located inside the ovary at the base of the pistil. 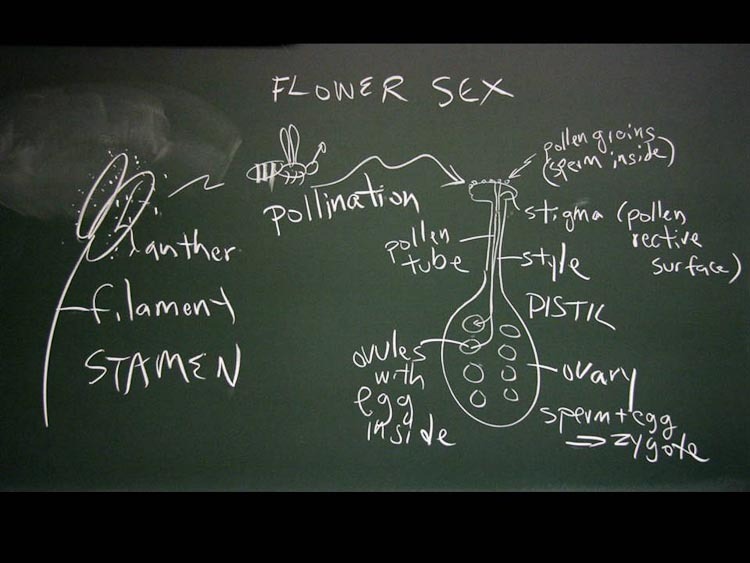 Each pollen grain contains only two sperm. In a special angiosperm-only phenomenon called “double fertilization,” one of the sperm cells fuses with the egg while the pathetically unlucky other one fuses with two other cells in the ovule, giving rise to a nutritive tissue called “endosperm.” Endosperm is food for the developing embryo or a newly-sprouted seed. Popcorn is mainly puffed endosperm. Yum. About pollen, it is interesting to note that: (1) a germinated pollen grain is actually a separate male individual plant (called the gametophyte), and (2) a growing pollen grain is one of the most quickly-growing living things. As a case in point, consider that for a big blossom like the rose-mallow hibiscus shown below, the roughly 6 cm distance from stigma to ovary is traversed by the tube in less than one day! Below, common rose-mallow. This robust marsh perennial herb is pollinated by two types of large bees. One of them is bumblebee, generalists that visit a great variety of flowers. The other is a specialist hibiscus bee, Ptilothrix bombiformis (Anthophoridae). The hibiscus bee assiduously gathers copious amounts of pollen with which to provision her below-gound nest. Hibiscus bee gathering rose-mallow pollen. 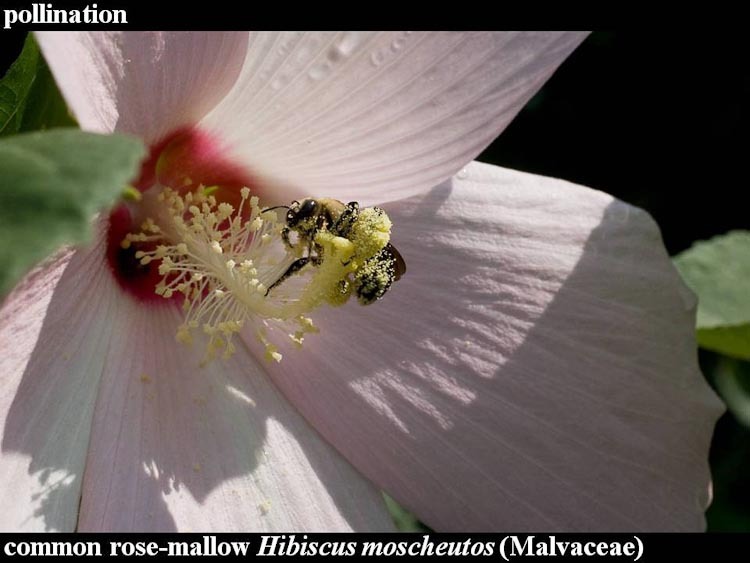 Below, a hibiscus bee gathers pollen from a rose-mallow blossom. Notice her first at another flower in the background and that upon her arrival to the new flower, she touches the stigmas inconveniently placed in her flight path. Hibiscus bee pollinating rose-mallow blossom. After pollination and fertilization have occurred, some or all of the other parts –calyx, corolla, androecium and the stigma/style portions of the pistil –may be shed. Within the ovary the ovule(s), each contain a developing embryo. As they develop, the ovary too ripens, sometimes assuming a fleshy form to elicit consumption by seed-dispersing animals. Thus a fruit is a ripened ovary containing seeds. Below, a rose-mallow fruit. It has opened (dehisced) to reveal the 5 section (carpels) of which it is composed and approx. 80 seeds. The remnants of the calyx (sepals) are present but the other flower parts are long gone. This type of fruit –a dry one, usually multi-seeded, composed of 2 or more units (carpels) is a capsule. 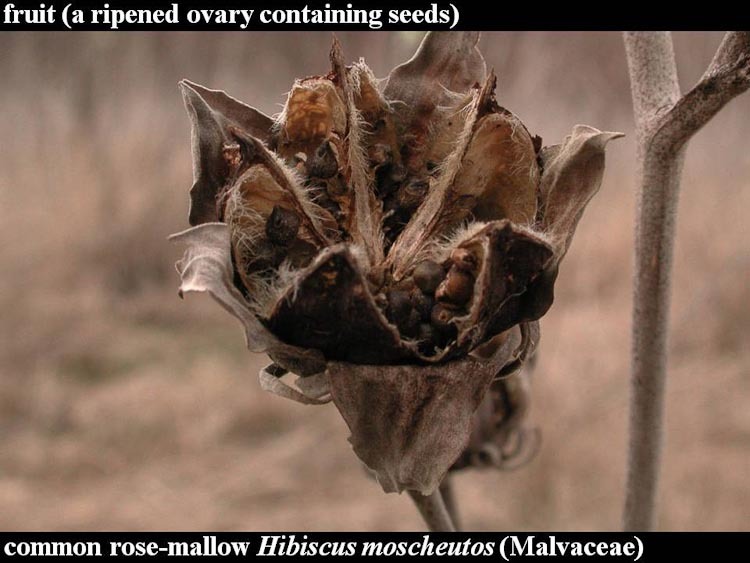 The rose-mallow fruit is a 5-chambered capsule. Usually, the plant – pollinator relationship is fairly flexible in that a given pollinator can forage on a number of different plant species, and a plant may have several different types of pollinators. An exception to this pattern is the interesting and famous exceptionally strict mutualism: the yucca – yucca moth mutualism. 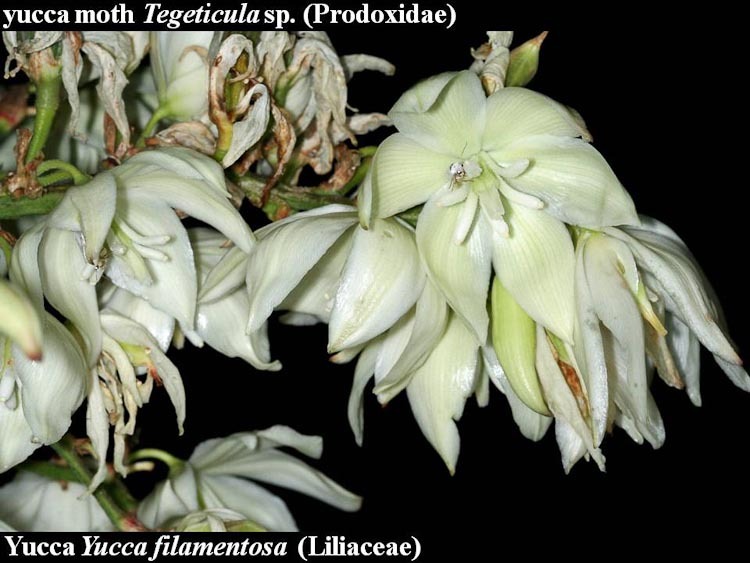 The plant is pollinated only by one type (several related species) of moth, while the moth is absolutely reliant on the yucca plant to sustain its young. Below, yucca. This is a eastern North American species that has been introduced into our area, where it is frequently seen along railroad tracks. 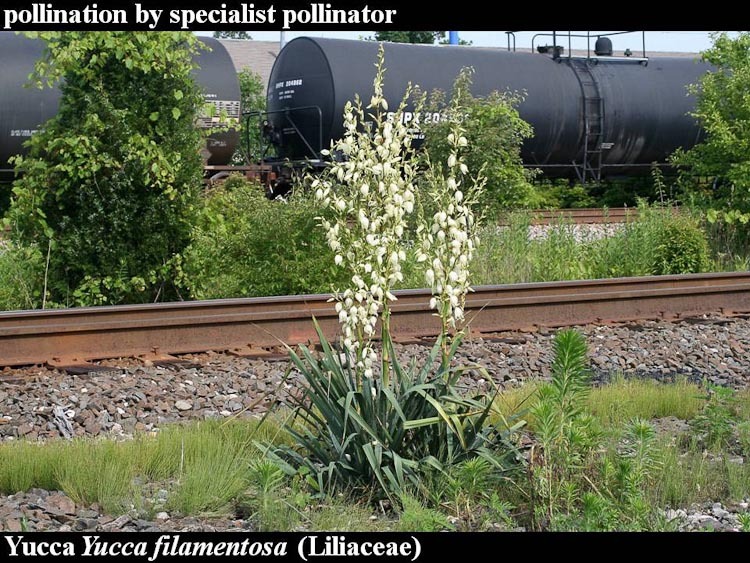 Yucca plants are frequent along RR tracks. Below, yucca flowers at night late in June. The flowers don’t produce nectar. Small anthers are perched at the tip of filaments that are stout –well suited for a moth to grasp on to. Small white moths flutter about, eventually settling inside the blossoms. Yucca flowers and yucca moths. Below, a yucca moth gathering pollen. The moth’s mouth parts are specialized for both gathering pollen and storing it in a ball under her chin. (Does a moth have a chin?) Soon afterwards, she flies off to another flower on another plant. 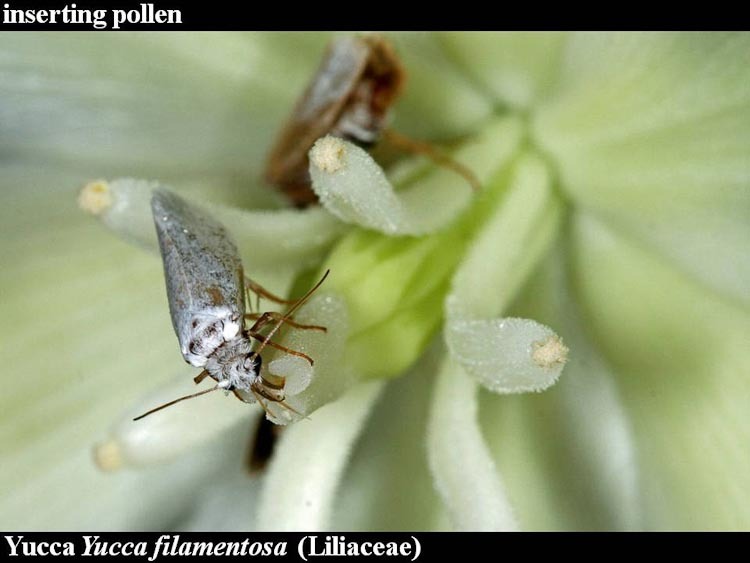 Yucca moth gathers pollen from anther of yucca flower. Below, oviposition. Arriving at a new blossom, the moth performs oviposition (egg-laying) by piercing the flower’s ovary with the tip of her abdomen and injecting several eggs into the ovary. 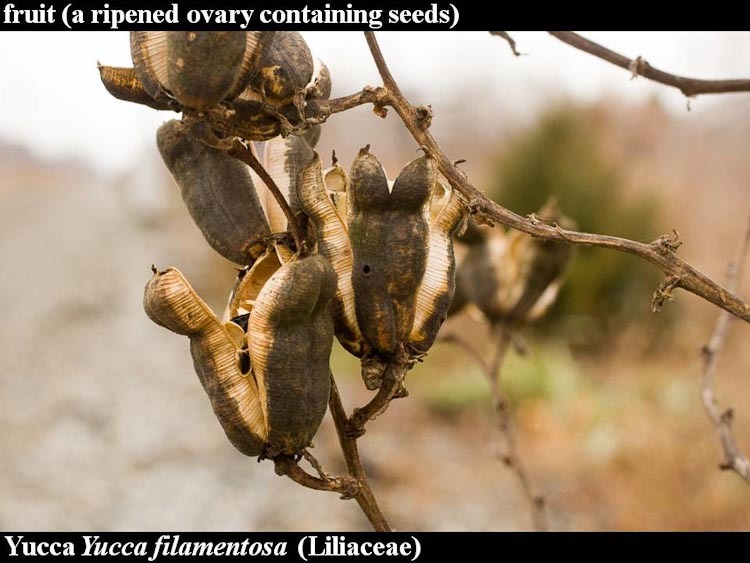 The larvae that hatch from the eggs will consume a portion of whatever seeds are developing inside the ovary. But this is only an effective strategy if indeed seeds are developing inside, so her next step is pollination of that flower. Below, pollination. After placing her precious eggs that are about to hatch into an ovary, the moth would like to be more of a moth…she wants to be mother. Hmm. 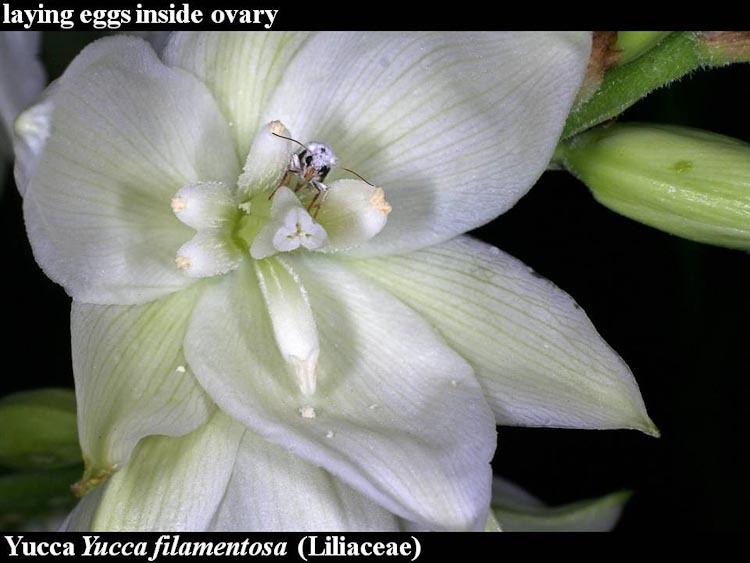 To ensure that, the first act following oviposition is to insert the ball of pollen previously gathered from another flower into the specially shaped stigma, thus ensuring that her babies will have a nice place in which to spend their childhood. She is a pistil-packing momma! Check out these yucca fruits. The moth’s babies (larvae) consume some, but not all, of the plant’s babies (seeds). Eventually, late-stage larvae chew their way out of the ovary and burrow underground where they pupate (form a cocoon) and spend the winter. Yucca fruits in late autumn.